Last week I was on holiday. 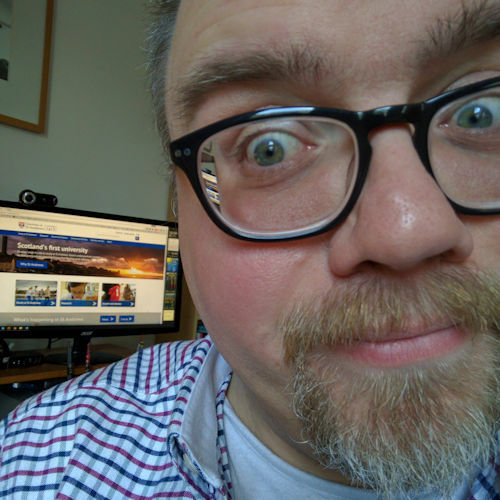 It was always my intention to blog as the week went along but I got too involved in other stuff, away from the computer. 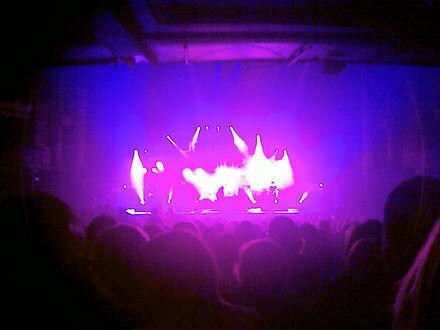 Deacon Blue in concert, looking more like Deacon Purple. Sunday was my birthday. I was 36. In the afternoon Jane and I drove to Edinburgh, met up with my brother Eddie and his wife Rebecca, went out for a meal and went to see Deacon Blue at the Edinburgh Playhouse. This gig was my first visit to the Edinburgh Playhouse for a gig since I saw Slayer there on the South of Heaven tour in 1988; Nuclear Assault supported them. The Deacon Blue gig was the oldest audience that I’ve ever been part of — Sunday morning worship besides. They kept sitting down during the quiet songs!! Hip trouble, I reckoned. It was also the quietest gig. I think MotÃ¶rhead’s Lemmy probably sneezes louder than the PA was cranked up on Sunday evening. My industrial-quality earplugs stayed firmly in my pocket. Still, it was a good evening out. Jane and Rebecca absolutely loved the concert, and sang along to almost everything. I even recognised about five or six songs. The highlight for me, however, was the support act: 6 Day Riot, who I thought were brilliant, quirky, folky and fun. They are a four-piece that play guitars, ukelele, double-bass and drums. Check them out at MySpace. I’ve already bought their debut album; and singer Tamara Schlesinger’s solo album too. Monday was the first day proper of my holiday, which usually means one thing in Chez Saunders: cleaning. 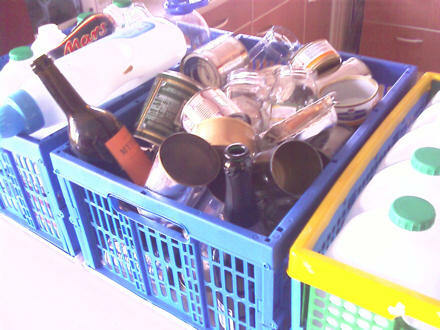 Cleaning and taking stuff for recycling. It was a good, clean start to my holiday. I woke up bright and early on Tuesday. It was day two of my holiday, which meant only one thing: DIY Day. 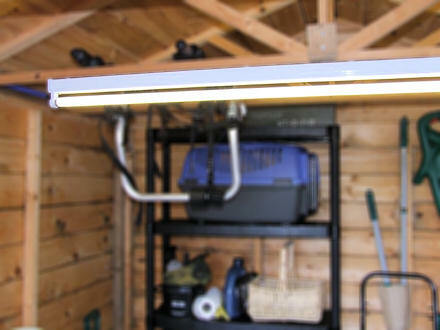 First up, the fluorescent light in the shed got replaced. Only £9.99 at Focus — bargain! Next up, the brass plaque that had been gifted to us for our former holiday cottage, Kadesh, found a new home on the shed door. Welcome Kadesh, Mk 2. 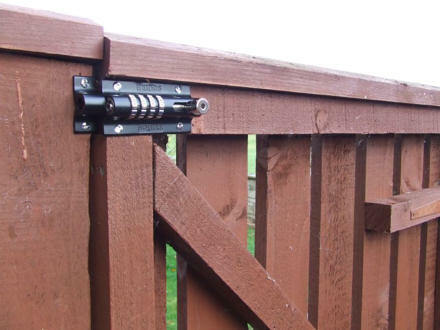 The new bolt for the back gate has been sitting around for months and months. It eventually was fixed to the top of the gate. No longer does out garden hose sit tangled in a heap on the ground in our back yard. 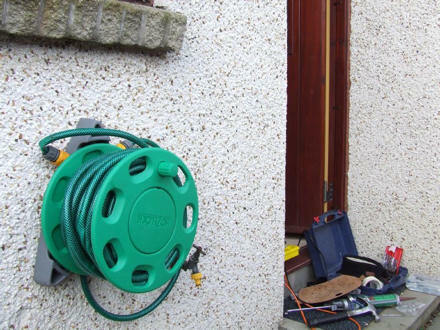 It is now neatly wound on this attractive, green hose reel. 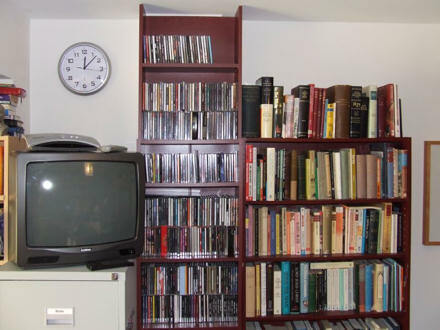 My favourite job was to create an extension for my CD bookcase, which I fashioned out of a broken bookcase that was destined for the local recycling centre / civic amenities site / dump. I now have 14 shelves of CDs! In the afternoon, I sorted out the cupboard in our joint study and installed Kubuntu 6.06 on Mum’s old PC. That was fun. I’ve been meaning to properly check out Linux distros for months. 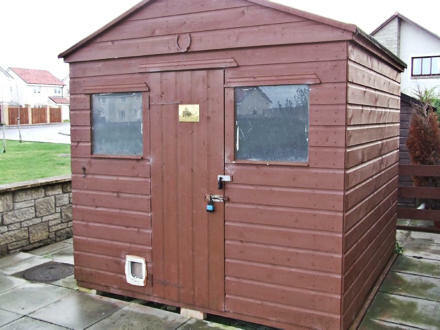 On Wednesday Jane’s folks moved into their new house in Anstruther. I went out for a cycle in the morning; hung around Jane’s folks’ new house in the afternoon offering a hand with some DIY. On Thursday morning Jane had an appointment at the hospital; a follow-up from an operation she had a few months ago. Thankfully all was clear and we could go off for a few days to Loch Rannoch on holiday. Only Kubuntu 6.06. The later versions are (even) more friendly. I have an old IBM Netfinity 300 running the server version of Ubuntu 7.10 and a fairly ancient Sony laptop dual booting with the desktop version. The server is running fine with installations of WordPress, Mediawiki and Joomla and Apache. Webmin provides most of the admin tools while Putty allows me to do command line type things directly. Putting Plone on is the project for next week. Apart from not being able to get the wireless working on the laptop under Ubuntu (grr -it works fine under XP) it is a perfectly usable laptop with Openoffice, Firefox and Thunderbird doing the needful. I am not a Linux expert by any stretch of the imagination but I have dealt with most of the problems I have encountered thanks to the help system and the amount of online resources available for ubuntu. I had a ready-made CD-ROM of Kubuntu 6.06 kindly sent to me by Team Kubuntu months ago. So I just used it. I simply wanted to see how easy it was to install. I’ve now downloaded the latest version as an ISO file. I’ll check it out soon. Ah! no wireless support for Ubuntu. But back to the post…. No, there is plenty of wireless support in Ubuntu. It’s just that I can’t get the particular combination of old SONY laptop and even older Netgear PCMCIA card working under ubuntu. I’m sure it is incompetence on my part and perhaps the wrong drivers because the wireless works fine on the same laptop/card when i use it with XP. Ubuntu is seeing the card (and indeed my wireless network). It’s just when I put in the WPA stuff it doesn’t seem to want to connect. It’s OK because I usually us the laptop on my desk with a wired Ethernet connection. I am typing this in Firefox on ubuntu 7.10. And with ubuntu it seems to be one or the other – not both at the same time as you can with XP. I am also sorely tempted to ditch VIsta on my Dell Inspiron 6400 and make it a dual boot XP/Ubuntu. Vista is just too hard to deal with sometimes. Setting an old PC up as a server using 7.10 is quite fun as well – it has pre-configured scripts to make it a mail engine, DNS/gateway box or a LAMP server. Once it is up and running you can use the Webmin from your browser to do the admin or telnet/SSH if you like command line stuff.